Porcelain crowns for your teeth look natural and function just like your own teeth. A porcelain crown costs a little more than an acrylic crown, but it also lasts a lot longer. How long do porcelain crowns last? Up to 30 years, when fitted properly by a Yonkers dentist open on Sunday and Saturday. Of course, you must take care of them properly to get the most wear out of them. Porcelain crowns are dental caps, but instead of being made of acrylic, they’re made of porcelain, an ideal material to replace a tooth. The goal is to create natural-looking teeth that fit comfortably in your mouth. 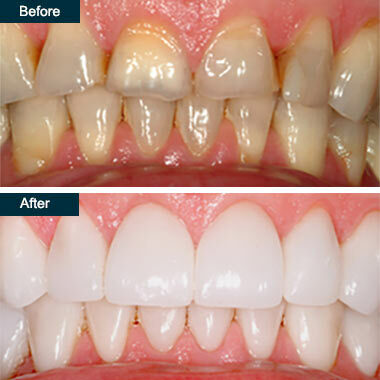 This doesn’t only restore your smile cosmetically; it also restores your teeth’s functionality. When you hear about porcelain crowns, certain questions arise. First, you probably start thinking about porcelain crown costs. Once that’s settled, you probably wonder how long do porcelain crowns last? When you go to a top Yonkers dentist for dental crowns, you need two visits. This process is time-intensive, but most people feel their time is well spent. During the first visit, your dentist prepares your tooth, removing any decay and cleaning the tooth and the teeth around it. An impression is made of your bite, which is used to make the crown. While waiting for the lab to make your porcelain crown, your dentist puts a temporary crown in place. At the second visit, your dentist removes the temporary crown and cleans up your tooth. Then the permanent porcelain crown is set and adjustments made. Finally, your Yonkers dentist cements the crown in place. Don’t put off getting this procedure for fear of the porcelain crown costs. While the price varies depending on where the tooth is located, your Yonkers dentist gives you the best value possible — and the price includes all the steps to cement the porcelain crown securely in place. Specifically, your porcelain crown cost should never exceed $3,000 per tooth, but most are much more reasonable: as low as $1,000 per tooth. Porcelain makes a strong, attractive replacement for your natural tooth. It shouldn’t chip, break or crack with normal use. It maintains its color, blending in with your other teeth. How long do porcelain crowns last? Long enough that you’ll forget which tooth it covers. Finding a dentist you trust makes all the difference. If you already have a relationship with a cosmetic dentist or family dentist open on Saturday and Saturday, ask about getting a porcelain crown instead of an acrylic or metal cap when you need a crown. They’re a significant investment in your oral health that pays off in many ways. The entire procedure takes no more than 80 minutes, although it may come after another procedure, such as a root canal. You may experience some minor discomfort afterward, especially if you’ve had a root canal. For this reason, you need a team of dentists with the most experience, like the dentists at Yonkers Dental Spa, who also are dedicated to providing you and your family with gentle, painless dentistry. Do you have any questions about the porcelain crowns in Yonkers? Would you like to schedule an appointment with the best cosmetic dentist in Yonkers of Park Avenue Smiles of Yonkers, Westchester County? Please contact our cosmetic dental clinic for consultation with the dental crowns specialist Farzin Farokhzadeh, DDS.